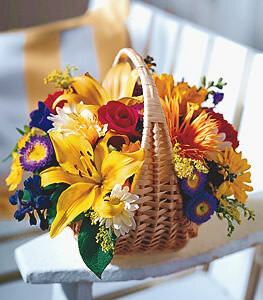 This basket holds a sampling of many favorite flowers. A red rose, yellow lily and white and yellow daisies are enriched by purple aster, white alstroemeria, blue delphinium, and more. Great to send for a birthday, get well, or simply just for fun.